Home » One of the most significant triggers for childhood trauma are adult relationships. » One of the most significant triggers for childhood trauma are adult relationships. One of the most significant triggers for childhood trauma are adult relationships. Title: One of the most significant triggers for childhood trauma are adult relationships. unre-solved hurt from the past is getting mixed up with hurt in the present and making it feel more unbearable or intense than it might otherwise feel. But because our child within demands an explanation, we all too often look for the one nearest at hand, “my husband / wife is really awful,” or “if only my kid were better behaved I wouldn’t be so upset.” We really think that the only thing that is affecting us is what we can see right in front of us. We may remain totally out of touch with what from our own past may be informing the intensity of our emotional reactions. In other words, we don’t know that we don’t know. 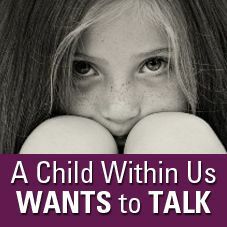 We project yesterday’s child withins pain, anger, and confusion onto today’s relationships without knowing why, and over time this becomes a self-fulfilling prophecy, we actually recreate the fear and pain that we experienced as children in our adult interactions. To complicate matters further, we may see the solution to our problems as continually changing the situation we’re in rather than examining what, inside of us, might be contributing to recreating our painful childhood relationship. “If only I had a better house, spouse, or boss I wouldn’t feel so helpless, angry and alone. I better change them so I can feel less lonely and stressed.” But more often than not, the real change that needs to happen is by understanding and contacting our child within.We understand that we were not the cause of the problem after all, that our shame and guilt over having been a bad and blamed child was perhaps misplaced, that it was simply our child withins attempt at making sense of a scary situation. We may also see that our parents were fallible people after all, not bad but perhaps stressed, immature and without resources themselves; that they were in above their heads. Labels: One of the most significant triggers for childhood trauma are adult relationships. Do not end up a bug on their windshield. We have a greater purpose than that!